We received two important updates from the City of Philadelphia today about the SRT trail closure announced December 5th, due to repair work on a fallen retaining wall. 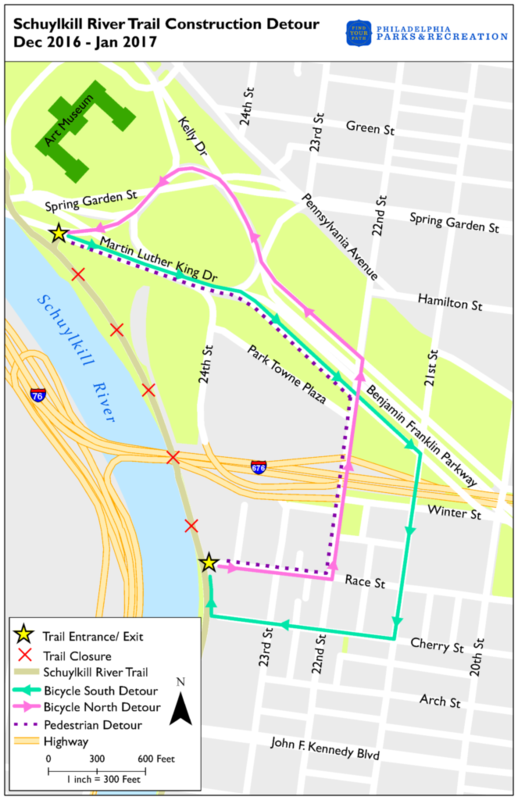 Earlier this week, we brought to the City’s attention that the trail was not being opened during commuting hours as implied by the earlier announcement and that while signs were up saying “Schuylkill Trail Closed Detour”, there was no map providing guidance on the detour. First, the Mayor’s Office issued an updated press announcement clarifying that unfortunately, yes, the trail closure is 24/7 and the path will not be opened for trail users during commuting hours. While we regret that such openings can’t occur for bicycle and pedestrian commuters who heavily use the SRT to access Center City, we understand that limiting access to the construction area with heavy equipment is in the interest of everyone’s safety. Secondly, Philadelphia Parks and Recreation staff prepared a detour map that is being distributed via social media and different organization’s websites. Please use caution on the streets, as traffic is heavy due to PennDOT’s Vine Street Bridge project channeling all south bound traffic onto 21st Street. Please use the Ben Franklin Parkway bike lanes when available or ride with traffic in the road lanes.